Music has always been important to making Samurai Jack the cult classic that it is. In a new music featurette released by Adult Swim, series creator Gendy Tartakovsky and composer Tyler Bates breakdown exactly how the team utilizes both music and sound to create the brutal new atmosphere for the mature Samurai Jack reboot coming to Adult Swim this year, and ultimately how the sound will enhance the show’s striking visual style. Ever since will.i.am sang the intro to Samurai Jack 15 years ago, music was clearly a defining part of the show, mixing hip-hop with electronic synths and breathtaking attention to audio detail. While the behind-the-scenes video from Adult Swim shows off some brand-new, uninterrupted footage from the upcoming reboot, more importantly, it showcases just how the music and sound design transforms Samurai Jack from just another stylish animated show into the fierce beast the reboot is shaping up to be. “For Jack, I wanted the next level,” explains Tartakovsky. “You know, 15 years ago we did the other show, and this show is for Adult Swim. It’s edgier, and it’s so much more emotional. There’s a different vibe to it and we’ve all grown as filmmakers so I wanted the music to grow also.” Tartakovsky can be seen in this video directing the sonic landscape of the show and in a cool twist, beatboxes sound effects and musical cues for the various scenes in Jack. 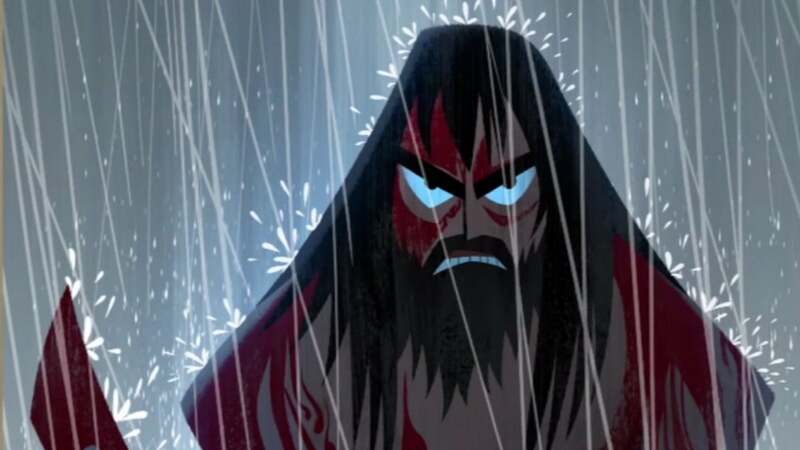 The video highlights just how precise everything in Samurai Jack sounds, from the noise of a steel blade being drawn out of its sheath, to the sound of rain pouring down on a desolate forest, to the roaring of a motorcycle engine. The bloody visuals might make the Samurai Jack reboot more appealing to adults, but the sound design goes a long way in helping emphasize each, artful moment in the show. “It’s exciting though because it’s somewhat of a new musical direction for Samurai Jack,” says Bates who works alongside Tartakovsky to create the soundtrack for the show. The shared goal between Tartakovsky and Bates as outlined in this video is to not overwhelm Samurai Jack with cool music. Instead, the two are working together to make sure each audio moment in the show is purposeful and impactful, letting sound, dialogue, or music take center stage at the appropriate time for maximum effect. The brand-new Samurai Jack will air on Cartoon Network’s mature programming block known as Adult Swim. The reboot takes place 50 years since the last season in which Aku destroyed every time portal, effectively stranding Jack lost in time. To make matters worse, Jack appears to have stopped aging as a side-effect of time-travelling, locking Jack in immortal combat with Aku. The all new Samurai Jack premieres on Adult Swim March 11, 2017.